Atomic absorption is an absorption process in which the amount of absorption of a reference emission beam by a ground state atomic vapor is measured and related to concentration. The emission beam is attenuated by atomic vapor absorption according to Beer's Law. The attenuated emission is focused directly on to a monochromator and the selected emission detected by a photomultiplier tube (PMT). The phenomenon responsible for atomic absorption was first observed in 1802 with the discovery of the Fraunhofer lines in the sun's spectrum. Since that time, it has been recognized that the phenomenon of atomic absorption is responsible for self-absorption and self-reversal in emission methods of analysis. However, it was not until 1955 that Walsh proposed that atomic absorption could be used for quantitative analysis. Mg is the atom of interest in the gas phase, \(Mg^*\), its excited state, and \(h\nu\), the quantum of absorbable radiation. This method provides not only sensitivity but also selectivity since other elements in the sample generally do not absorb close enough to the chosen wavelength to interfere with the measurement. In order to reduce background interference, the wavelength of interest is isolated by a monochromator placed between the sample and the detector. The efficiency of production of free atoms depends on a great number of variables, some of which can easily be varied to optimize the sensitivity of the technique. Some of these variables are the oxidant-fuel composition used to produce the flame (e.g. air-acetylene, nitrous oxide-acetylene), the flame temperature, the sample feed rate, the design of the burner, and the solvent and other components in the sample matrix. In the following experiment, the role of these variables will be examined in sections E(a), E(b), and E(c), and atomic absorption spectroscopy used to determine Fe and Mn in plant tissue. The method of serial dilutions is employed to eliminate unnecessary error when preparing standards from stock solutions. Prepare one solution containing both 100 ppm Fe and 100 ppm Mn from the 1000 ppm laboratory stock solutions provided in the lab. This is a 10x dilution. Using your freshly made 100 ppm stock, prepare a 10 ppm standard and finally from this 10 ppm standard prepare the following standards: 5 ppm, 2.5 ppm, 2 ppm, 1 ppm, and 0.5 ppm. Reserve the 100-ppm solution for the standard addition technique. You need 10ml of the 100, 5.0, 2.5, 2.0, and 0.5 ppm solutions, 50 ml of the 1 ppm solution and 50 ml of the 10 ppm solution. Make your dilutions accordingly. Show your dilution strategy to your TA before beginning the experiment. Carefully weigh out three samples (~2 g each) of the plant tissue and note the exact weight. The analysis will be performed on each sample. Note: The following digestion must be done in the hood. Place the weighed portion of the plant material in a 250 mL clean Erlenmeyer flask. Now add approximately 30 mL of conc. HNO3 acid and gently heat to just below boiling by adjusting the temperature on the hotplate. Typically a setting of 3 or 4 is sufficient. When the volume is diminished, place a stemless glass funnel upside down over the mouth of the Erlenmeyer flask to act as condenser. This will prevent over drying and possible charring and degradation of your sample. After ~30 minutes most oxidation will have ceased. Cool to room temperature and add ~10 ml of 30% H2O2. Again, gently heat to just below boiling. When most oxidation has stopped, boil the mixture down to near dryness using a hot plate. Watch the mixture carefully as it approaches dryness to prevent burning. Let it cool before transferring it to a 100-ml volumetric flask. Dilute the solution to the mark with DI/Degassed water. After the sample is made, filter it into a clean flask or bottle. The filtered solution is the one to be analyzed. Digestion of the sample with HNO3 and H2O2 breaks down the organic material in the plant tissue which complexes the iron. This must be done to get free Fe3+ in solution. Caution: HNO3 and H2O2 are both extremely dangerous. Painful burns will result if either comes in contact with your skin. Wear gloves and goggles at all times at be extremely careful. 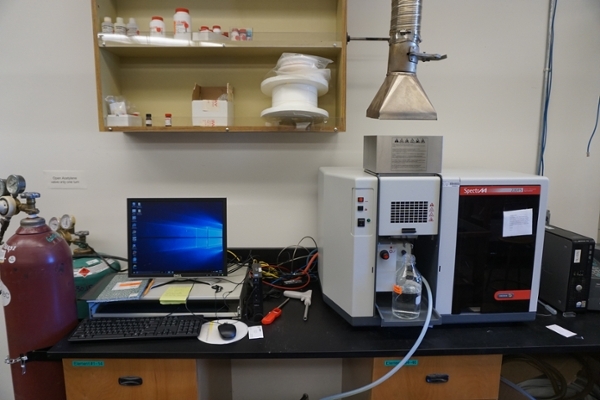 The Varian FS-220 Atomic Adsorption Spectrometer in room 3480 is pictured below. The Varian SpectrAA FS-220 Atomic Absorption Spectrometer is a multi-channel instrument with four lamp positions. The lamps are either single element or, as used in this experiment, multi-element. This lamp can be used for analysis of iron, manganese, As with many modern analytical instruments, it is almost completely controlled with software from a PC. Parameters such as the air flow, the acetylene flow, the monochromator settings, and the lamp intensity can all be set in a "method," which is then downloaded to the instrument. Cautions: Acetylene is highly explosive under certain conditions; the acetylene regulator output pressure should never exceed 15 psi. The cylinders will be opened and adjusted by your instructor. Any problems which arise should be brought to the attention of the laboratory instructor immediately. Read through the entire procedure before beginning your analysis. Make sure the AA power switch has been turned on before starting the software on the computer. Doubleclick the SpectrAA icon on the desktop. Click on the Worksheet button. Click on the "New From…." button. Select the worksheet "Chem 105 AA.AAWS," give it a unique name, and fill in the Analyst and Comment entries. The worksheet opens to the Analysis page, since this method has been previously developed for this application. Note the different windows - the calibration entries are in the lower right hand corner, and the sample entries are in the upper middle. You can click on the Fe or Mn boxes in the sample entries to see the analysis parameters for each of these elements. Note that the analysis wavelength has been chosen based on the element, but it is possible to change to a different emission line if necessary. After having the lab instructor check the system, light the flame by pressing the ignition button and holding it until the flame ignites. The ignition button is the one with the drawing of a flame next to it. Remove the aspiration tube from the distilled water and note the change in the flame sound. If there is no discernible change in the sound, the tube may be blocked, and must be cleared. Place the tube back in the distilled water. Click the Start button on the worksheet. A dialogue box will appear telling you to prepare for instrument zero. Make sure the aspiration tube is in deionized water, and press OK or Enter. In a few moments, a dialog box will appear for Calibration Zero. Continue aspirating the deionized water and press OK or Enter. The next dialog box to appear will ask you to Present Standard Solution 1, which will be your 0.5 ppm standard. Place the aspiration tube into the standard, and click OK. Do not remove the aspiration tube from the standard until the measurement is complete and the next dialog box appears. Continue through the standards, until a complete calibration curve has been generated for Mn. At this time, the software will ask you to Present Solution Sample 1. Do the three samples you prepared as the dialog boxes prompt you. After these are complete, the same sequence will be repeated, but this time the wavelength will be changed to 248.3 to measure the Fe. After all standards and samples are completed for the Fe analyses, the flame will be automatically extinguished and the computer will begin playing a happy little tune. When you get sick of the happy little tune, click OK in the dialog box. Save all of your results with the menu item File…Save. Go to the Reports page using the menu bar item Window…Reports. Click on your file name, even if it's already been highlighted. Then click on the Report tab. Click on the "Print Report" button, and your data will be sent to the network printer. Using the procedure above, sequentially measure all six standard solutions. Record all concentrations and their absorbance values. From this data determine the linear working range of each of the two elements. These will be your standard calibration curves for Fe and Mn. Atomic absorption analyses of trace elements in plant tissue are now routinely carried out by soil and plant tissue laboratories. The analysis of plant tissue, usually leaves or petioles, provides a better guide to plant fertilizer requirements then that provided by soil analysis. In this experiment we shall analyze sugar beet leaves for their Fe and Mn content. Obtain the absorbance for each of the three digested leaf samples previously prepared and report the final corrected results in ppm Fe and Mn in the original dried leaf sample. Finally, use the method of standard additions to obtain a more accurate result. Read the absorbance resulting after each addition to check that the increase in absorbance is that expected. Read section 1E2 of your textbook (pp 15-17) for a discussion on the Method of Standard Additions (remember to spike your unknown with a concentration that lies within the linear working range). Use only three additions for each of your three samples and test only for iron. Standard Addition curves for all three samples. Additionally, denote the working range of your standard calibration curve and include a least squares fit for your working calibration curve.